One of our favorite writers here at Age of Aces is Donald E. Keyhoe, but he is as well known for his UFO research as he is for the air war stories he wrote for the pulps. Here is one of his earliest books on the subject, published in 1950. Keyhoe is a graduate of the U.S. Naval Academy at Annapolis. He flew in active service with the Marine Corps, managed the tour of the historic plane in which Bennett and Byrd made their North Pole flight, was aide to Charles Lindbergh after the famous Paris flight, and was chief of information for the Aeronautics Branch, Department of Commerce. 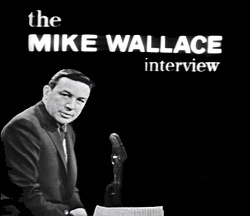 The Harry Ransom Center at The University of Texas at Austin has a collection of The Mike Wallace Interview shows on line including the one he conducted with Major Donald E. Keyhoe in 1958.